On spiritual retreat in Chartres, France, I am seeking God—looking at stained-glass windows, walking the labyrinth, taking long runs by the river, reading Scripture, worshiping in community, thinking, writing, and praying. This is the first in a series of postings on knowing and following Jesus more fully. For me, the answer is pretty simple. Nothing has more dramatically impacted my life and perspective on the future than Jesus—his life, death, and resurrection—and the hope he gives me of eternal life with God after death. Recently, one of my sons and I went to see the movie, Knowing. Nicholas Cage stars as a Massachusetts Institute of Technology professor, who stumbles upon a sheet of numbers buried in the ground 50 years earlier. The more he investigates, the more he discovers that the numbers might be pointing to a series of disasters. Can he figure out the code? Can he stop the disaster from happening? Can he convince his scientist friends that he is not crazy? I won’t give away the ending, but let me say this film goes where “no man (or woman) has gone before”. Well, actually, the apocalyptic genre is well represented in literature, but few films dare to grapple with the end of the world in such a sobering manner, without a super-hero implausibly saving the day. In doing so, the film taps into the worst fears gripping much of the human race today (annihilation), while grappling with powerful human experiences that lead so many to faith in a higher power and in life after death. Knowing terrified and comforted both. There is hope for those who are “called” and who listen to the “whispering” of the benevolent voices, warning them and guiding them. The biblical writers do something quite similar in dealing with ultimate matters. Prophets and apostles terrify those who dare to spurn the will of God, while offering hope to those who are called to faith by the grace of God, and who listen and follow the leading of the Spirit. The biggest difference between the movie and the Bible is that Scripture actually names the source of our hope—Jesus Christ—and puts the hope of salvation within reach of anyone who believes. 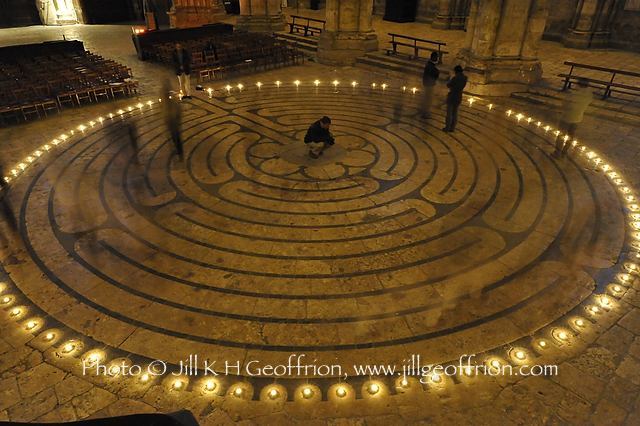 Last week, Jill and I led a prayer walk for the Chemin Neuf (New Way) Christian Community on the labyrinth on the stone floor of the magnificent Chartres Cathedral. As I approached the center, I found myself asking God to show me the way forward in my life. In a flash, the words of Jesus came to my mind: “I am the way, the truth and the life” (John 14:6). I had my answer. I still have many questions and issues to resolve, but I know where my process needs to start. Knowing God and knowing how to best proceed need to be grounded in my relationship with Jesus. It seems I keep forgetting this most basic of spiritual truths. Holy Week is a very good time to come to know Jesus better by taking extra time to focus on him, his life, his death, and his resurrection. What else—who else—can better help you know what your life is about and give you better hope for the future? Thank you for sharing your thoughts, Tim. You hit the nail head right on center when you wrote “Knowing God and knowing how best to proceed need to be grounded in my relationship with Jesus.” This is the way the truth and the life!! With all that has happened in the past two weeks in our lives, our relationship with Jesus has helped us as a family. Thank you for your encouragement. God has used you and your blog to minister to our grief stricken hearts. Erik and I are planning to see the movie you mentioned, this weekend. With your thoughts in mind, I will be watching the movie in a different perspective.